Noblemania: "The Dark Knight Rises" and "Bill the Boy Wonder"
Batman is one of our greatest fictional champions of justice, so it is cruelly ironic that the story of where he came from hides a gross injustice: the man largely responsible for him receives no official credit. What’s more, co-creator and original writer Bill Finger is the one who first called Batman “the Dark Knight,” yet Bill’s name will not appear in the credits of The Dark Knight Rises (nor did it in The Dark Knight). The nickname “Dark Knight” is so iconic that the word “Batman” doesn’t even need to appear with it; meanwhile, the mind behind it is left in the dark. Yet I came up with one way to link Bill with the movie and hopefully do some good for my book in the process. 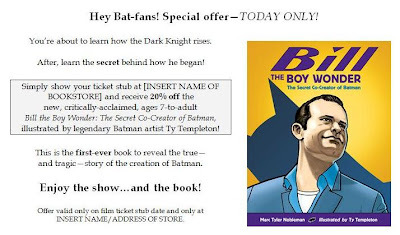 Bill the Boy Wonder: The Secret Co-Creator of Batman publishes July 1. Ask the nearest cinemas if they will hand out the flyer to people who buy tickets to TDKR. If even the smallest fraction of moviegoers goes for the same-day incentive, I’d consider this effort a success. In part that is because the smallest fraction of the projected audience of the movie—1.939 zajillion—is several nations unto themselves. As it stands, I couldn’t figure how to extra-sweeten the deal for the cinemas…but they have nothing to lose, either. Perhaps they’ll view this as value-added, serving their customers some historical perspective with their blockbuster. Perhaps they’ll feel a moral obligation to do their part for Finger when so many (but not Finger) will be making so much on his genius. Perhaps they just like Batman. Bookstores, if you set the discount, and cinemas, if we provide the flyers, who’s in? Actually without a clear advantage for the cinemas I can't help wondering why they would participate. It's pretty obviously a promotional campaign, and businesses providing access to a presold audience generally get compensated for such. They also do have something to lose by potentially annoying the film's marketing team. Nice idea, but needs some development. I'd say talk to WB, talk to the major bookstore chains remaining, or local stores that could use the rub, talk to theatre chains such as Regal (which will overcharge a lot of ticket prices, IMPO). Since this is so late in the game, an 11th hour push might not work, but it wouldn't hurt. Hey Marc, did this promotional campaign work out? Chuck, thanks for asking. Alas, I did not hear of anyone doing it. Darn, it was a good and admirable idea. The work continues! Thanks Chuck! If you are on Twitter, I suggest you follow me because soon I will be announcing at least one and possibly two even cooler Bill Finger initiatives: https://twitter.com/MarcTNobleman.